One of the unfortunate side effects of dealing with ALS is having to deal with the progressive loss of balance. Usually resulting in the unexpected face plant. In my particular case, my balance is still pretty good but I am prone to falling from time to time and as most of my losses in my hands and arms. I am unable to properly protect myself in a fall. And once down, getting up is starting to become rather difficult. I have had a few occasions were fallen and required help to get back on my feet. So this got me thinking. What happens when I'm by myself and I fall somewhere in the house and I'm unable to get up? How do I call for help? Well, there are for sure services like the life alert bracelets and the "help by fallen and I can't get up" panic button. This got me thinking, sure I could sign up for one of the services. But I already have a smart phone which I use quite regularly for my home automation systems and my television remote control. Not to mention it has a Siri voice recognition, which is one of the reasons why I bought it. So do I really need the life link service? Other than the built-in fall detection, my iPhone will cover my needs. Thus the question becomes, how do I keep up with my all a time? With nonfunctioning hands, I need to keep it attached to my person while remaining accessible. 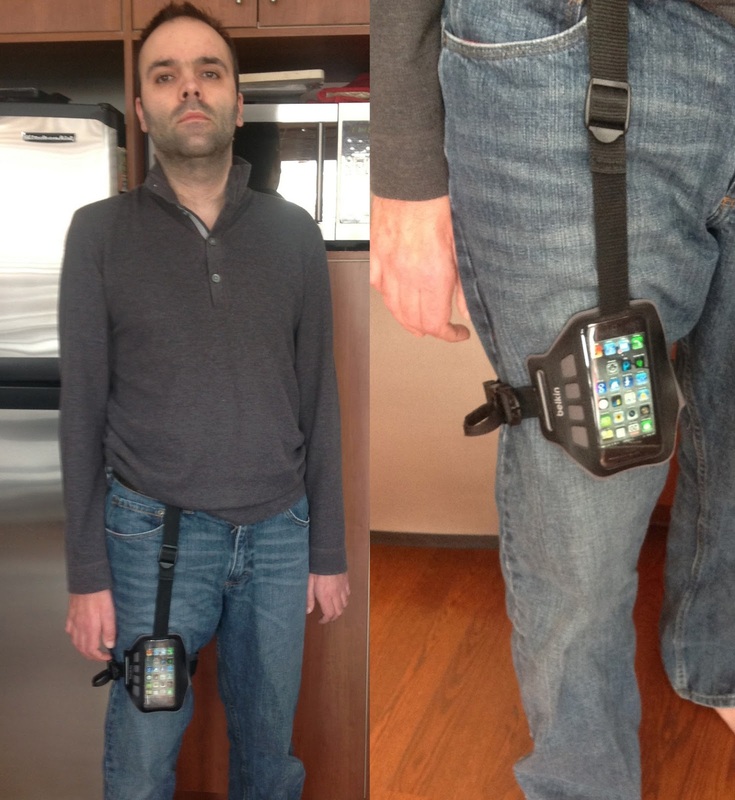 Not to mention, anything attached to my belt, one involving a clip to dock the iPhone are pretty much out of the question. I don't have the range of motion to access my belt, nor the dexterity to unsnap the phone from a clip. How could I do this with my smart phone? What could I adapt? 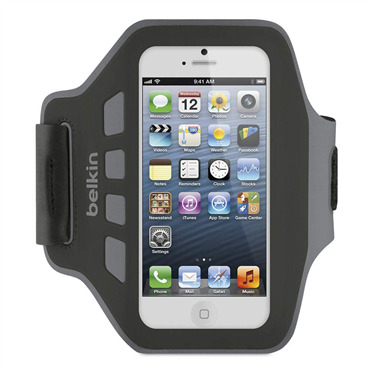 It turns out that Belkin has an armband product to hold iPhones for when you go to the gym. It is quite secure and will allow you to use the touchscreen through a plastic cover. It is however sized for an arm and not a thigh… Just a bit of a size difference, even with atrophy. Nonetheless, this is pretty close to what I'm looking for and reasonably easy to adapt. It was also reasonably inexpensive, around C$25. It will definitely work as a first prototype. I realize that this looks a bit dorky. But the fact of the matter is these days I have to focus on function over fashion and if it gives me a degree of ease of access and safety within my own home… So be it. Dorky. Now, this works reasonably well. But not perfectly. First of all, in order for the iPhone to fit within the Belkin case it has to be removed from any other case. E.g. the iPhone has to be "naked" to fit properly. Also is an extremely tight fit making it nearly impossible for me to insert or remove the iPhone to the Belkin case myself. The plastic cover over the screen does work and allows me to use the screens touch functions. However it is not completely flush to the screen, removing some of its sensitivity. It is also a little bit tricky to properly access the home button. But not impossible. I really should mention that I am actively considering getting one of those life alert devices and it does have some significant benefits that should not be overlooked. One of the reasons why I'm looking into this is that my needs are not quite there yet and I really do want to minimize the amount of devices and things I have to drag around with me. I'm looking at the phone as a viable option because I carry it all over the place. I use it to control my TV and my home automation system. And of course, Siri for communications. Really smart Jeff, i am constantly in envy of your gadget solutions! I think its awesome that you can use your creativity to come up with these, its quite an inspiration. Don't stop blogging! Thank I believe your blog post for sharing with me. It is really great information from with me. It is tremendous blog,i need to be like you.A good website with interesting content & all the concepts really convencing & will definitely work.I will bookmarked your website & take the feeds addtionally happy to find so many useful info. That's a cool way to handle iPhone or any other gadget solution. Thanks for sharing such interesting detail of upcoming gadgets.